snowdeal.org > ex machina: a peachy mother's day. 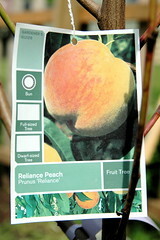 while it's fruit will never be mistaken for a "georgia peach", we've heard from some locals that they've had good luck with the hearty prunus reliance in our growing zone. maybe having fresh fruit in our front yard will finally convince me that peaches are, in fact, edible. odin definitely didn't get his taste for the fruit from me. i think one too many attempts to get me to eat canned peaches in my yoot ruined me.